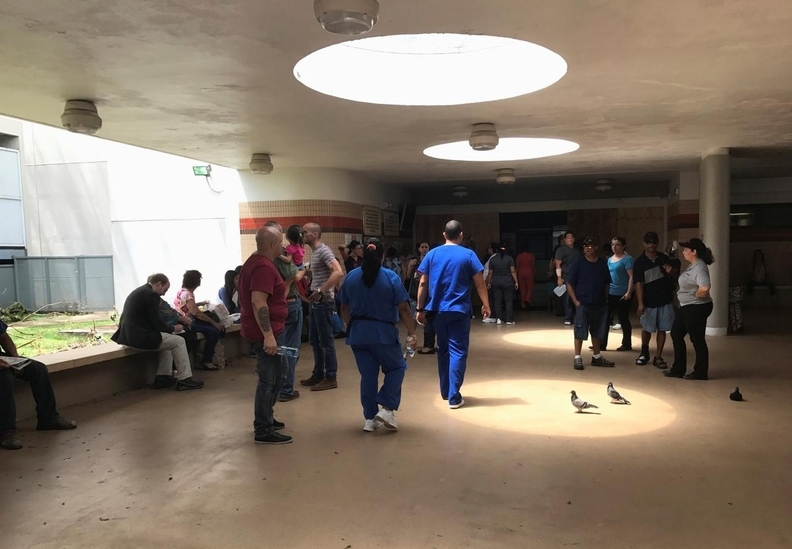 Nurses and patients at a San Juan hospital in Puerto Rico on Sept. 23, 2017. The death toll in Puerto Rico due to Hurricane Maria is much higher than previously estimated, according to a new analysis. The report released Tuesday by George Washington University's Milken Institute School of Public Health estimated that 2,975 deaths occurred on the island in the six months following Hurricane Maria's landfall in September 2017. The official death toll released by the Puerto Rican government in the aftermath of the storm determined 64 people had died due to the storms. The low number of certified deaths was part of the basis for President Donald Trump's praise for the federal government's response effort despite multiple reports indicating a severe public health crisis was looming with the loss of consistent electrical power or access to clean water for months throughout several parts of the island. "Every death is a horror," said Trump at a news conference during his visit to Puerto Rico in October 2017. "But if you look at a real catastrophe like [Hurricane] Katrina and you look at the tremendous—hundreds and hundreds of people that died—and you look at what happened here with, really, a storm that was just totally overpowering … no one has ever seen anything like this." The report is the latest analysis that has rebuffed the Puerto Rican government's death count. A Harvard analysis published in May in the New England Journal of Medicine estimated a mortality rate of more than 14 deaths for every 1,000 residents from Sept. 20 through Dec. 31, 2017, which yielded a total of 4,645 excess deaths. "This household-based survey suggests that the number of excess deaths related to Hurricane Maria in Puerto Rico is more than 70 times the official estimate," the researchers noted. In a report to Congress earlier this year, Puerto Rico officials estimated that there were 1,427 more deaths in the four months following hurricanes Maria and Irma than occurred during the same period in each of the previous four years. In light of the discrepancies, the latest study was commissioned by the governor of Puerto Rico and analyzed death certificates and other mortality data for six months following the storm and compared the total number of deaths during that time to the expected number based on historical patterns. "The results of our epidemiological study suggest that, tragically, Hurricane Maria led to a large number of excess deaths throughout the island," principal investigator Dr. Carlos Santos-Burgoa, a professor of global health at GW Milken, said in a written statement. "Certain groups—those in lower income areas and the elderly—faced the highest risk." The analysis cited a number of factors for the crisis after the hurricane. One of the most notable challenges was the lack of trained personnel, causing the island's emergency response to be inadequate for certifying deaths. Also, the report cited an overall lack of a formalized command structure for emergency communications, which led to a breakdown in coordination between central and municipal governments. The report recommended several steps the Puerto Rican government could take to improve its death surveillance capabilities following a disaster as well as its emergency preparedness. One measure was for the government to monitor for possible spikes in death rates in certain areas and within certain vulnerable populations such as the elderly or children. The analysis called for the government to fully staff key positions within its health department's Vital Statistics Registry and Bureau of Forensic Sciences and to improve coordination between those entities. "The inadequate preparedness and personnel training for crisis and emergency risk communication, combined with numerous barriers to accurate, timely information and factors that increased rumor generation, ultimately decreased the perceived transparency and credibility of the Government of Puerto Rico," investigators concluded.